We take an extraordinary journey into the mountains of southern China to witness the lives and century-old festivals of the minority tribes of the Guizhou region. We've timed our visit to coincide with four exciting village festivals where locals turn out in their most spectacular traditional costume to enjoy singing, dancing and sports. Our tour starts in Guiyang, the capital of Guizhou Province. The city lies on the banks of the Nanming River on the central slopes of the Miaoling Mountains. Guizhou has an extremely rich mix of minority tribes including the Miao, Bouyi, Dong, Zhuang,Yao and Bai. Its landscape of karst mountains, plunging waterfalls and terraced rice fields provide a spectacular setting for this journey into the heart of the region's tribal culture. Guiyang is now very much a modern city and representative of China's booming economy. After our tour briefing this morning,we plan some easy-going sightseeing to mingle amongst its inhabitants and soak up the atmosphere of some of the more interesting spots such as the bustling Flower and Bird market. We also see Guiyang's landmark, the 20 meter high Jiaxiulou Tower which dates back to the 16th century. In the afternoon we drive west out of the city to Luizhi, the base for our visit to the Longhorn Miao villages of Longga. This morning we drive into the mountains around Longga to attend the Tiaohuacha festival of the Longhorn Miao. Their name comes from the large 'horns' of hair with which the woman adorn themselves and both these and their traditional embroidered clothing are very striking. There are approximately four thousand Longhorn Miao people living in 12 villages around Longga. Poor transportation has historically prevented them from having much contact with the outside world and life has changed little, keeping the old traditions alive. Even today, marriage is still arranged within the tribe and the Tiaohuacha festival is an important opportunity for young people to find a marriage partner. We will attend on the 10th and final day of the festival when locals from all the villages gather together in their best outfits to sing and dance throughout the day in the open air. Each evening during the festival, young boys from a village go together to another village to look for girls. At the same time, the girls in the village gather together to wait for the boys coming. When the boys arrive, they all sit together in a communal room with a fire in the middle and sing to each other to express their affections throughout the night. The boys go home the following morning and return again in the evening if they find a girl who takes their fancy. At the end of the day we return to Luizhi for the night. Today we will visit the spectacular Huangguoshu (Yellow Fruit Tree) Falls, the largest in China and reputedly the longest drop of any falls in Asia, measuring an impressive 84 metres and over 80 metres in width. A series of steep, water soaked steps leads to a suspension bridge that crosses into a verdant, forested landscape, where there may be an opportunity to walk behind the falls and enter the impressive 100m long 'Water Curtain Cave' that lies behind it. Later we visit a Bouyi village built of stone. The Bouyi have inhabited this region since Stone Age times, mainly occupying the fertile landscapes along the valleys and rivers and their deft skills with embroidery and brocade are renowned. We overnight in the nearby city of Anshun. Today we will attend a Lusheng courtship festival near Kaili. The Lusheng is a traditional reed pipe wind instrument of the Miao that is played at and has given its name to the courtship festivals of the tribe. Lasting two days in each village, the festivals take place on the 5th - 23rd of the 1st lunar month in different villages around Kaili. During the festival, Miao villagers gather together and dance in the village square, wearing their finest costumes. These outfits can be so complicated to dress and undress that the girls' mothers are always in attendance to lend a hand. In the square, people dance in circles while in the middle folk musicians play the Lusheng. As the girls dance in the square, the men watch buffalos fighting in the fields. After enjoying the festival we will continue to Nande village where we will stay with Miao families. The number of homestays used will depend on the size of the group. This is a unique opportunity to observe the everyday rural life of this minority group. We spend today both with our hosts in Nande and a visit to other Miao villages in the area. One of the larger of China's ethnic minorities the Miao are a deeply spiritual people who are thought to have originated from the Yellow River valleys some 4,500 year ago. Famed for their exceptional skills with embroidery and handicrafts, the Miao are known for the ornate headdresses that they wear during festivities, the women adorning themselves with elaborate silver headdresses and jewellery, their hand woven and brightly coloured clothes bedecked with intricate embroidery. Even the men dress to impress, sometimes wearing light coloured turbans and huge silver ringed necklaces. The homestay accommodation which we stay at features non-western style squat toilets. Driving to Leishan, we'll meet the villagers who will teach us the Dragon Dance. We'll join them in the parade in to the town and take part in the festival with our own Dragon and colourful waistcoats. Today we visit the nearby Miao villages of Shudian, Paika and Datang for the chance to mingle and take in village life. In the afternoon, we return to Leishan to see the preparations for the evening fire-dragon dance festival celebrations. When it's getting dark, 20 to 30 firework-laden dragons will dance through the streets of the town with people setting off fireworks on the way. They dance from one family to another to give blessings and good wishes for the coming year. Following last nights festivities we have a relaxed day in the town today. Traditionally the locals will spend the day cooking up a feast that is shared by all. We'll take the opportunity to share this meal with the locals and take time to hear how they enjoyed the festival. 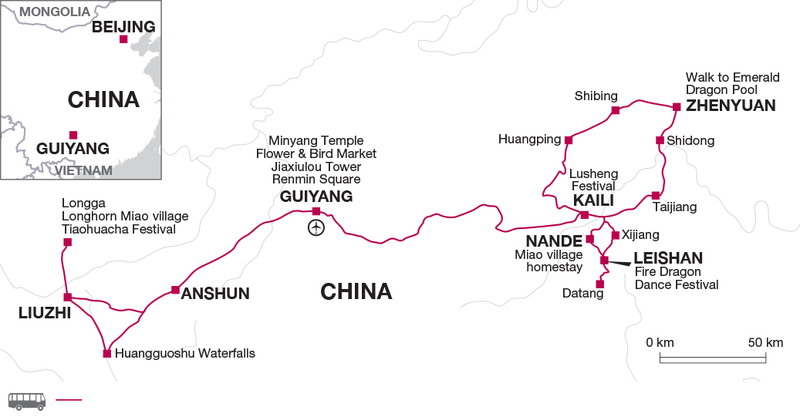 Day 10 - Drive to Zhenyuan via Tailjiang and Shidong. Explore the town. Today we take a drive through the Miao heartlands to Zhenyuan via the town of Shidong. Shidong is famous for its 'Sisters' rice festival', an annual event that sees villagers descending on the area from the remote mountain regions in search of a partner. Ancient Zhengyuan was founded as a Ming outpost guarding the trade routes into central China and covers an area of just over 3 square kilometres. It has been inhabited by the Miao for centuries and is an atmospheric place littered with relics of the past. We aim to explore the old quarter on foot and take a walk up the hillside behind the town for a bird's eye view of the traditional style houses. Today we have the option to walk out towards another local village with a viewpoint back towards Zhenyuan. Our route back will including walks on part of the old city wall, through old streets and along the riverside back to the hotel. Later we drive to Kaili. Kaili is the regional capital for both the Miao and the Dong people with tribal people making up about 70% of its population of around half a million. The city and its surrounding villages will play host to a major Lusheng festival with some of the most spectacular costumes, music and traditional dancing. We plan to attend the opening ceremony and watch the dances in nearby Zhouxi village. At festival time the Miao women wear their stunning silver jewellery often piling on five or six neck rings at a time as well as chains, coins, chest locks and multiple headdresses. Much of this silver was originally obtained from melting old coins. The festival is very much a time for the people to get together and socialize and be entertained by singing and dancing with markets also set up for trading goods. Today we drive to Guiyang and visit Qianling Park, a beautful green area just outside the city centre which includes a lake and several temples, and is named afte Qianling Hill. The tour ends in Guiyang after breakfast. Those departing on the group flight to London will depart for the airport early morning. Comfortable shoes or trainers. Please pack for colder temperatures. You are best to bring in multiple layers of clothes that can be added or removed according to your level of activity. Thermal winter clothing is ideal. We also suggest a warm hat and gloves. Although it is not the wet season, some form of rain protection is recommended. Visits to the festival sites can be long days on your feet and involve a lot of walking therefore we'd recommend comfortable lightweight walking shoes. You will need a towel for the nights spend at the homestay. Bedding is provided at the homestay but you may wish to bring a sheet sleeping bag. You may find a plastic mug, fork and spoon useful. Please note that it will be hard to cater for vegetarians, vegans and those with dietry requirements in this region.